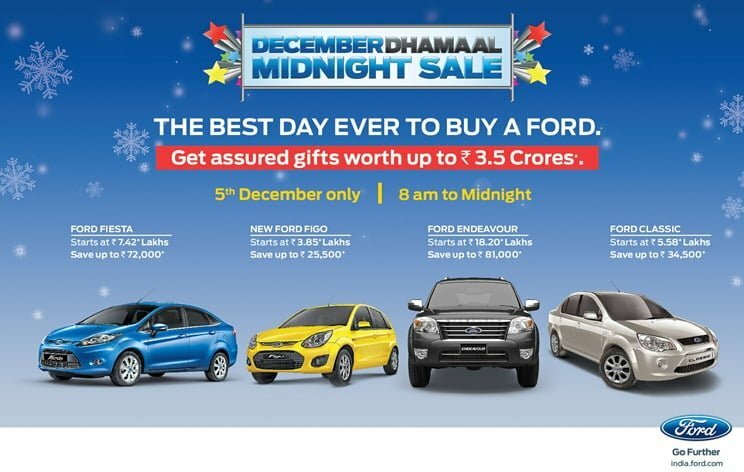 Ford India has previously also organized its popular December Dhamaal midnight sale in India in December 2011 which received a warm response from the Ford buyers and fans across India. With the success records of previous year, Ford is here to bring back the excitement of midnight sale starting 5th December 2012 which will continue till the end of December 2012. During this unique midnight sales, all 160 Ford India dealerships in India across 129 cities will remain open from 8 AM to midnight to allow more and more buyers to visit Ford showrooms, test drive and book their Ford cars. Not only does it provide convenience to buyers, but also it also offers many special gifts and offers to the Ford customers who but their Ford cars during this period. Ford India is giving away assured gifts of worth up to Rs. 3.5 crores during this offer to customers who book their Ford cars, the gifts include LED TVs, home thereafter systems, other useful home appliances etc. During this celebration offer, the dealerships will be decorated in colorful themes to welcome the customers. Other than special gifts which customers get, there are offers like low interest rates, discounts and insurance benefits which vary on different car models. For India is also promoting this campaign though Facebook Throw a Pillow app to engage more and more people with the midnight sales.